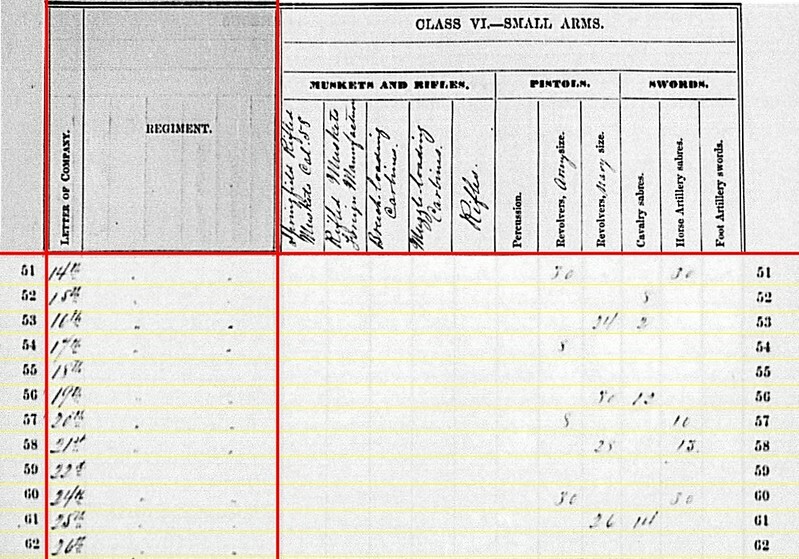 The 2nd New York Artillery Regiment mustered, by company, through the fall and winter of 1861 at Staten Island. Moving in batches of companies, the regiment moved to Washington, D.C. and became part of the capital’s defenses through the first half of the war. 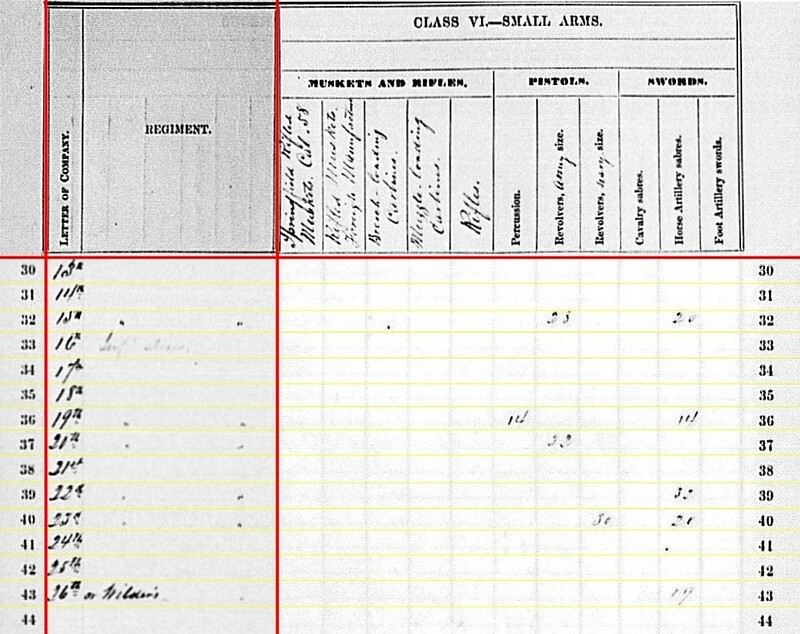 As related in the previous quarter, there was one “black sheep” in this regiment – Battery L.
In June 1862, Battery L took to the field as field artillery assigned to the Second Corps, Army of Virginia. The battery saw action at Cedar Mountain and the Northern Virginia Campaign which followed. With reorganizations that followed Second Manassas, Battery L went to Ninth Corps. They saw action at Antietam and later at Fredericksburg, remaining with their new formation through the winter that followed. And when Burnside took the Ninth Corps west, Battery L transferred to Kentucky. In June, 1863, the battery was among the reinforcements (two divisions of the corps) sent to Vicksburg. With the conclusion of that campaign, the Ninth Corps detachment returned to Kentucky and became part of Burnside’s East Tennessee Campaign. 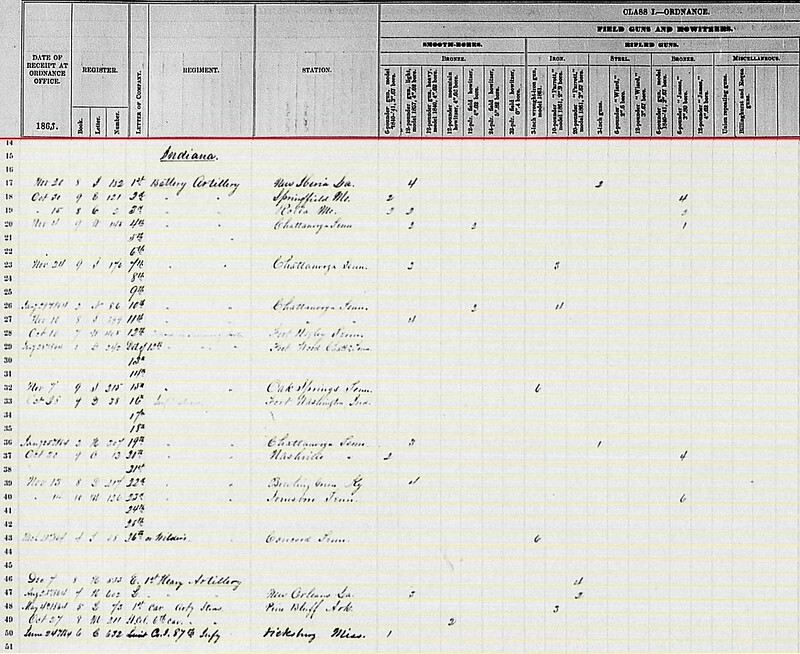 All told, Battery L logged a lot of travel miles in 1863, the majority of which were in transit between theaters of action. Battery L: At Knoxville, Tennessee with four 3-inch steel rifles. As these were on the Ordnance rifle column the previous quarter, we should question the consistency of the clerks. Captain Jacob Roemer commanded this battery, then assigned to Second Division, Ninth Corps. After September, the battery transferred to First Division. And in November, they were officially removed from the 2nd New York and re-designated the 34th New York Independent Battery. Battery L: 96 canister, 30 percussion shell, 219 fuse shell and 424 bullet shell for 3-inch rifles. Battery L: 30 shells for 3-inch rifles. Battery L: Twelve Army revolvers and fourteen horse artillery sabers. While we could put a period here and call our look at the 2nd New York Artillery done, that’s not the whole story. The rest of those companies (which was often preferred over “battery” for heavy artillery) were still stationed at Washington, D.C., with Colonel Joseph N.G. Whistler commanding. The regiment served in First Brigade of those forces deployed south of the Potomac (Virginia side). They are associated with Forts Haggerty, Corcoran, Strong, and C.F. Smith. Later, in the following spring, the regiment would leave those forts for an assignment with the Army of the Potomac. But that’s getting ahead of the story a bit. 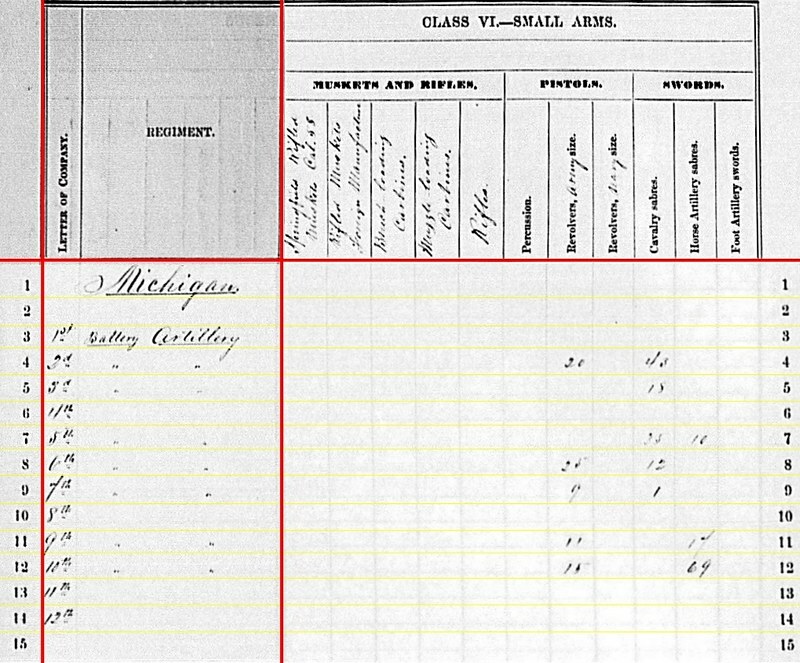 Company A: Captain William A. Berry. Company B: Captain Michael O’Brien. Company C: Captaincy vacant. Captain George Hogg was dismissed in May (he was reinstated later, but by that time Hogg was mustered as a Major. Lieutenant Robert K. Stewart the senior officer as of September 1863. Company D: Captain John Jones. Company E: Captain George Klinck. Company F: Captain George S. Dawson. 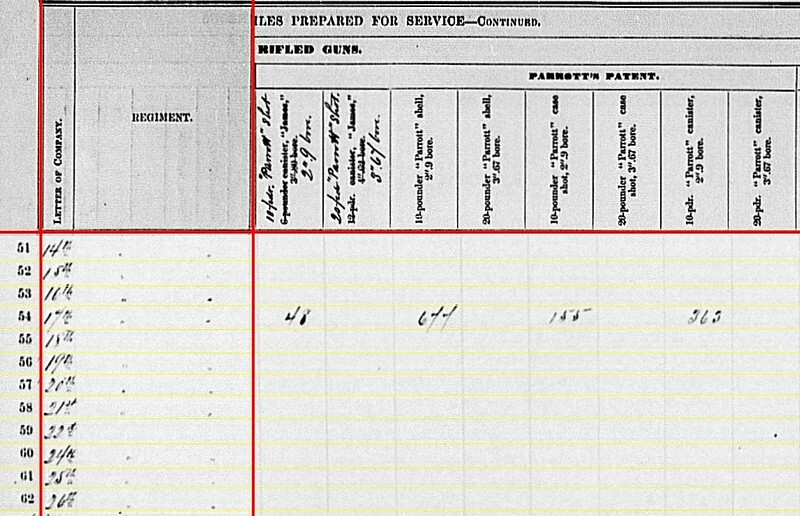 Company G: Captain Thomas J. Clarke. 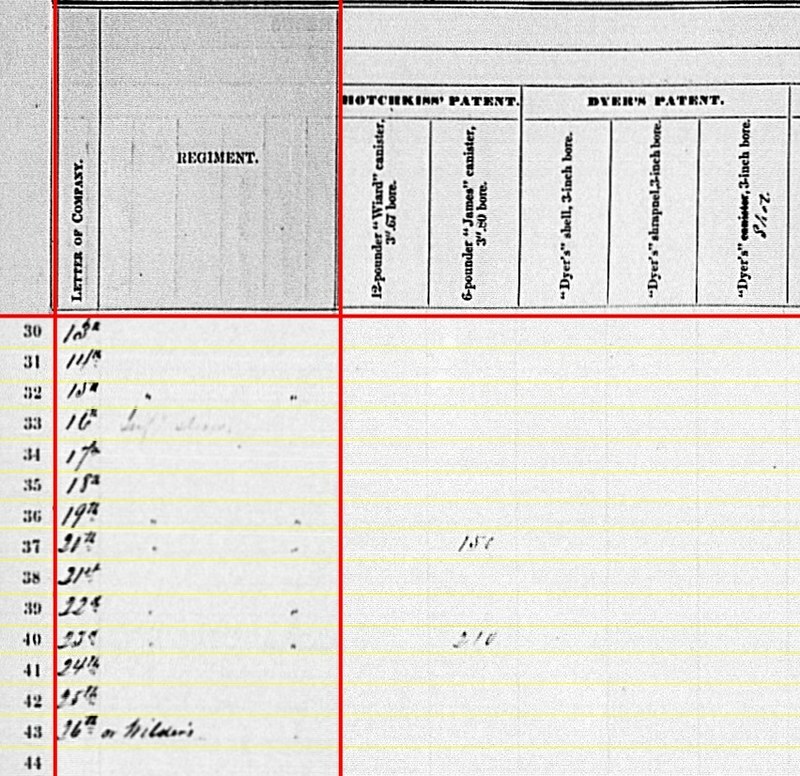 Company H: Captain Charles L. Smith. 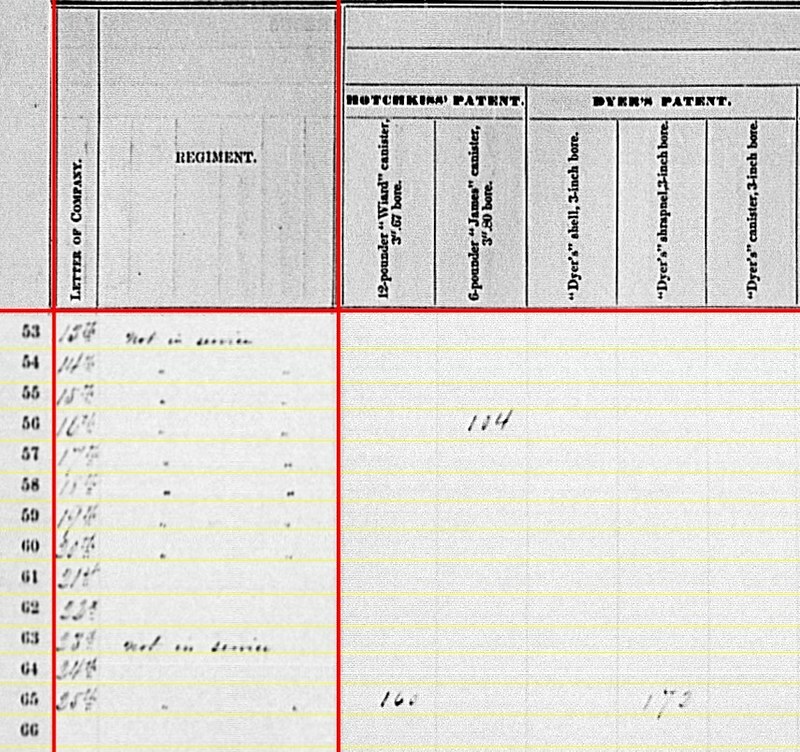 Company I: Captain Abner C. Griffen. 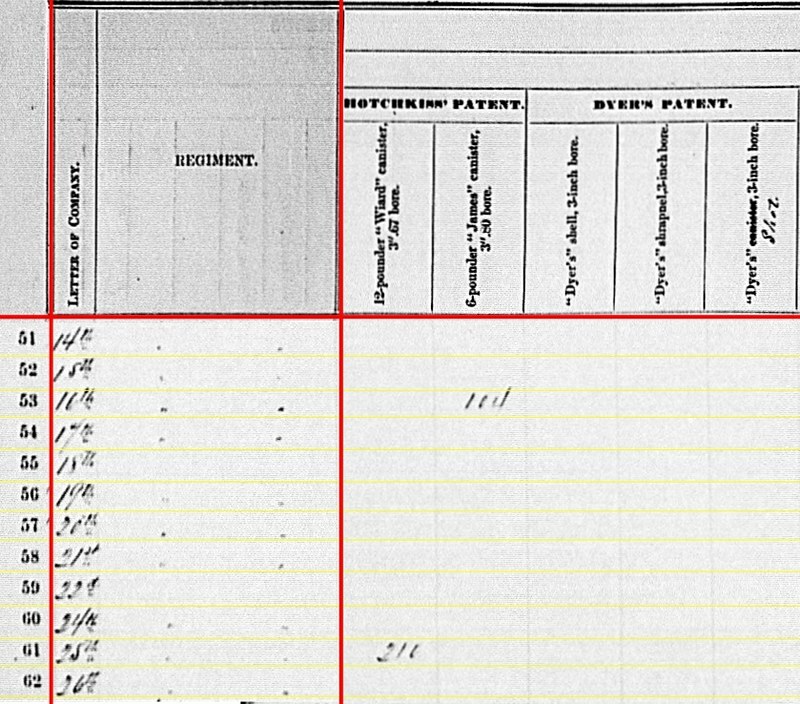 Company K: Captain Pliny L. Joslin. 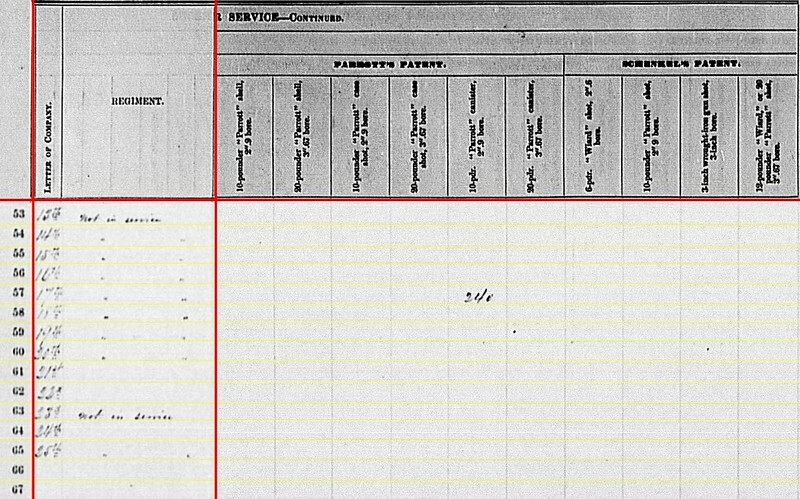 Company M: Captain Oscar F. Hulser. Keep in mind the heavy artillery usually worked by detachments of battalion size, assigned to work specific forts. As such, their structure more closely matched infantry units than their field artillery brethren. Thus made the field grade officers even more important to the unit. At that time, Colonel Whistler could call upon Lieutenant-Colonel Jeremiah Palmer, Major William A. McKay, Major Thomas McGuire, the adore-mentioned and Major George Hogg. 1st Battery (Battery A): No return. Also known as the Loomis Battery, for its first commander. Lieutenant George W. Van Pelt led this battery, supporting First division Fourteenth Corps, into action on September 19, at Chickamauga. They worked their six (though reports earlier in the year indicated five) 10-pdr Parrotts through four changes of position before firing their first shot in the battle, near (not on) Winfrey Field. The battery got off only 64 rounds before the Confederates were upon them. “The men remained with the battery until the enemy’s bayonets were at their breasts,” wrote Captain George Kensel, Division Artillery Chief. Van Pelt and five of his men were killed. Six were seriously wounded and thirteen more captured. Along with much of the battery equipment, five guns were captured. Lieutenant August H. Bachman managed to extract one of the guns. Three guns were recaptured later in the battle, but in poor shape. (Of note… one Parrott was recaptured on Missionary Ridge and the last around Atlanta… and allegedly returned to the battery.) Lieutenant Almerick W. Wilbur assumed command of the battery in Chattanooga. With the exception of a few demonstrations, the battery would remain at Chattanooga for the rest of the war. 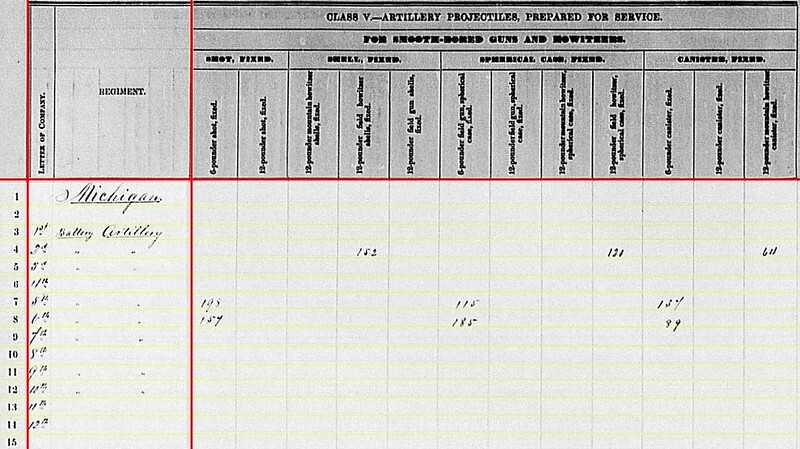 2nd Battery (Battery B): Reporting from Corinth, Tennessee with two 12-pdr howitzers, two 3-inch Ordnance rifles (moved over from the “steel” column), and two 10-pdr Parrotts. Lieutenant Albert F. R. Arndt, still in command, was promoted to Captain in early September. The battery remained at Corinth until October, when it moved to Pulaski, Tennessee, as part of the Sixteenth Corps. 3rd Battery (Battery C): Still at Memphis, Tennessee, but now with four 10-pdr Parrotts. Captain George Robinson remained in command of this battery, assigned to the District of Memphis (Fifth Division), Sixteenth Corps. 4th Battery (Battery D): No return. 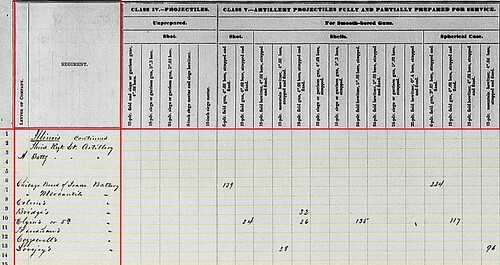 In the previous quarter, Captain Josiah W. Church reported two 12-pdr field howitzers, two 10-pdr Parrotts, and two James 3.80-inch rifles. And that’s what this battery, supporting Third Division, Fourteenth Corps, took into action at Chickamauga. We might say this battery was “fought out” by two hard days fighting. They left the field spent and with only one howitzer. They lost 35 horses in the battle, but only seven men wounded and four missing. Church provided a very detailed accounting of all material lost on the field. So many items listed that I dare say a blank summary line would be close to accurate. And, from the statements of several, that equipment was not given up without a fight! The battery reorganized in Chattanooga and would receive 20-pdr Parrotts. 5th Battery (Battery E): At Nashville, Tennessee with two 6-pdr field guns and four 10-pdr Parrotts. This battery, part of the Reserve Corps, Army of the Cumberland, spent most of the summer in Murfreesboro. In mid-September, Captain John J. Ely’s battery returned to Nashville. 6th Battery (Battery F): At Glasgow, Kentucky with two 6-pdr field guns and two 10-pdr Parrotts. By some reports, the battery had sections at Munfordsville, Bowling Green, and Louisville, through October 1863. Captain Luther F. Hale commanded overall, and at Munfordsville. One section of the battery, under Hale, was at Munfordsville. Another section, under Lieutenant Byron D. Paddock, garrisoned Bowling Green. In October, both sections merged at Glasgow, Kentucky, part of the District of Central Kentucky, Department of the Ohio. At that time Hale was promoted to major, and Paddock, with a captain’s commission, took the battery. 7th Battery (Battery G): At Carrolton, Louisiana with six 3-inch Ordnance Rifles. The battery was assigned to the Ninth Division, Thirteenth Corps, commanded by Captain Charles H. Lanphere, through August of 1863. Subsequently assigned to the New Orleans garrison, Department of the Gulf. Upon Lanphere’s resignation at the first of September, Lieutenant George L. Stillman took over the battery. 8th Battery (Battery H): No return. 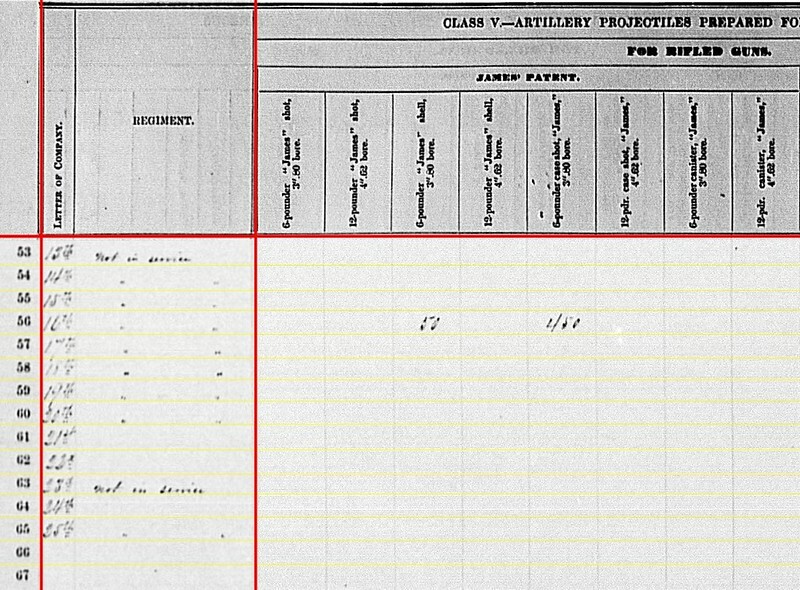 In the previous quarter, the battery reported two 12-pdr field howitzers, one 6-pdr (3.67-inch) rifles, and two James (3.80-inch) rifles. With Captain Samuel De Golyer mortally wounded during the Vicksburg Siege, and Captain Theodore W. Lockwood moving to a cavalry unit. Lieutenant Marcus D. Elliot commanded this battery. The battery was assigned to Third Division, Seventeenth Corps and spent the summer at Vicksburg (with most of the battery on furlough). 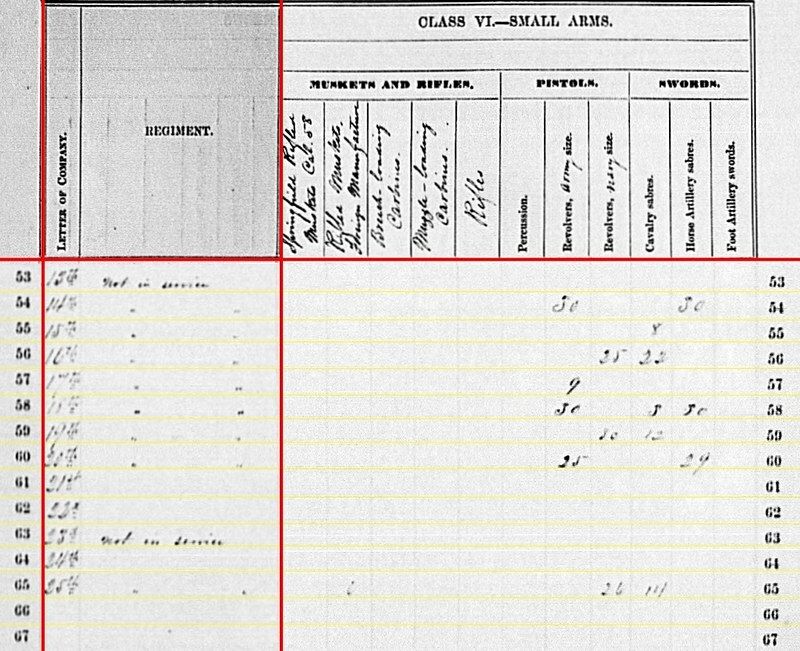 9th Battery (Battery I): Reporting at Culpeper, Virginia with four 3-inch rifles. Captain Jabez J. Daniels commanded this battery, assigned to the 1st Horse Artillery Brigade, Army of the Potomac. The battery was reassigned to the Eleventh Corps in October, and move with that formation to Chattanooga. 10th Battery (Battery K): At Chattanooga, Tennessee, with four 3-inch rifles. 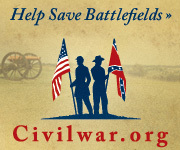 However, this reflects the September 1864 posting date. In September 1863, the battery was at Camp Barry, Washington, D.C.. Captain John C. Schuetz commanded. The battery was sent west as part of the reinforcements sent to Chattanooga in November, as part of the Eleventh Corps. 11th Battery (Battery L): No return. Under Captain Charles J. Thompson. After seeing their first service in the response to Morgan’s Raid, the battery joined Third Division, Twenty-Third Corps, Department of the Ohio. The battery saw service in the advance to Knoxville during the fall. 12th Battery (Battery M): No return. Captain Edward G. Hillier commanded. The battery did not leave the state until July 9, being dispatched to Indianapolis in reaction to Morgan’s Raid. From there, the battery moved to Camp Nelson, Kentucky, in mid-September. From there, the battery joined Wilcox’s Division, Twenty-Third Corps advancing on the Cumberland Gap. In the previous quarter, we saw three additional lines under Michigan’s batteries. 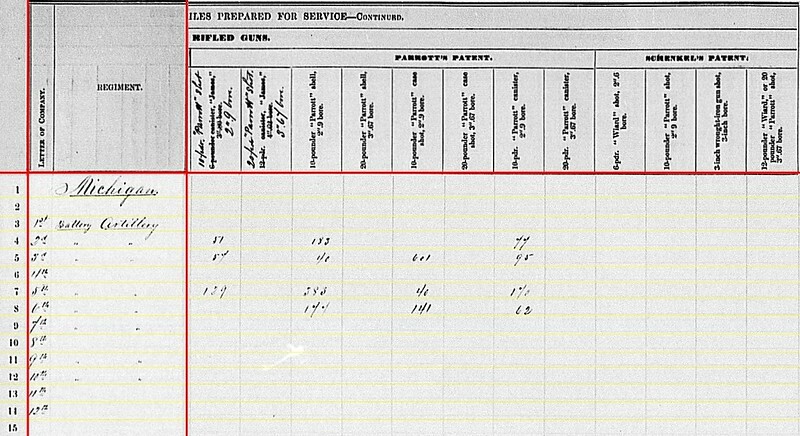 One of those was likely a section from the 6th Battery/Battery F. Another was just reporting stores being held by the 18th Michigan Infantry, which were likely turned in by the end of the summer. However, it is worth speculating that the 12th Michigan Infantry still retained a 12-pdr field howitzer while marching on Little Rock, Arkansas in the fall. 2nd Battery / Battery B: 152 shell, 128(?) case, and 64 canister for 12-pdr field howitzers. 5th Battery / Battery E: 198 shot, 115 case, and 134 canister for 6-pdr field guns. 6th Battery / Battery F: 157 shot, 185 case, and 89 canister for 6-pdr field guns. 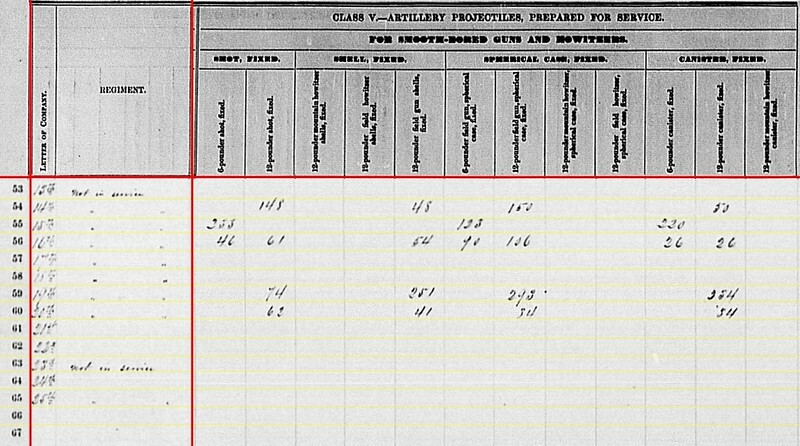 2nd Battery / Battery B: 83 canister, 72 percussion shell, 72 fuse shell, and 240 bullet shell for 3-inch rifles. 7th Battery / Battery G: 123 canister, 159 fuse shell, and 509 bullet shell for 3-inch rifles. 9th Battery / Battery I: 360 shot, 60 canister, 60 percussion shell, and 120 fuse shell for 3-inch rifles. 10th Battery / Battery K: 402 shot, 96 canister, 165 percussion shell, and 179 fuse shell for 3-inch rifles. 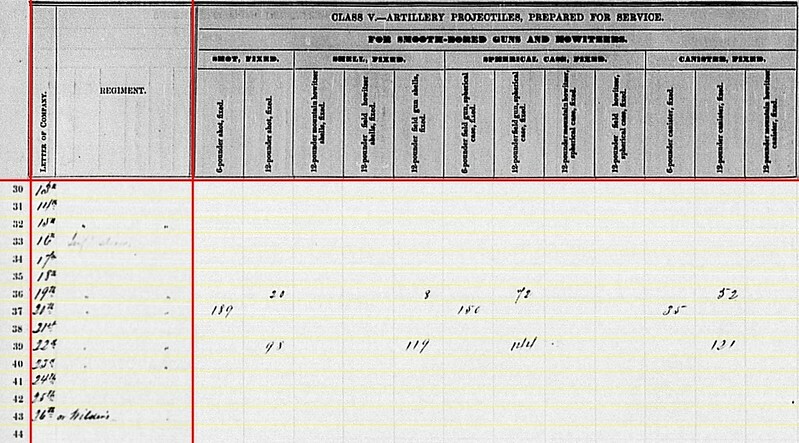 2th Battery / Battery B: 51 shot, 183 shell, and 77 canister for 10-pdr Parrott. 3rd Battery / Battery C: 57 shot, 40 shell, 601 case, and 95 canister for 10-pdr Parrott. 5th Battery / Battery E: 129 shot, 383 shell, 40 case, and 170 canister for 10-pdr Parrott. 6th Battery / Battery F: 177 shell, 141 case, and 62 canister for 10-pdr Parrott. 5th Battery / Battery E: 60 shell and 100 case for 10-pdr Parrotts. 2nd Battery / Battery B: Twenty Army revolvers and forty-three cavalry sabers. 3rd Battery / Battery C: Eighteen cavalry sabers. 5th Battery / Battery E: Twenty-five cavalry sabers and ten horse artillery sabers. 6th Battery / Battery F: Twenty-five Army revolvers and twelve cavalry sabers. 7th Battery / Battery G: Nine Army revolvers and one cavalry saber. 9th Battery / Battery I: Eleven Army revolvers and seventeen horse artillery sabers. 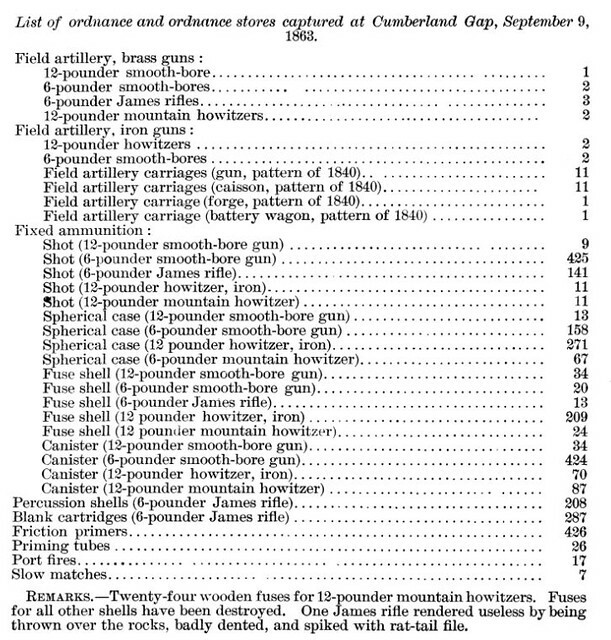 10th Battery / Battery H: Fifteen Army revolvers and sixty-nine horse artillery sabers. Worth noting, Captain Church reported, within a lengthy list of accouterments and implements missing after Chickamauga, the 4th Battery lost four revolvers and five sabers.